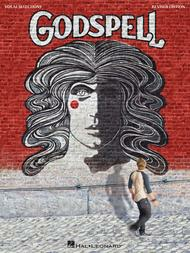 Godspell composed by Stephen Schwartz. For Piano/Keyboard, Vocal. Vocal Score. Broadway. Difficulty: medium. Songbook. Vocal melody, harmony part, piano accompaniment, chord names and black & white photos. 140 pages. Published by Hal Leonard (HL.362260).ISBN 0881884707. With vocal melody, harmony part, piano accompaniment, chord names and black & white photos. Broadway. 9x12 inches.13 selections from one of the most popular musicals ever. Includes: All Good Gifts • Bless the Lord • By My Side • Day by Day • Prepare Ye (The Way of the Lord) • and more. 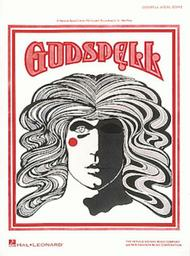 Godspell composed by Stephen Schwartz. For Piano/Vocal. Vocal Selections. Songbook. Vocal melody, piano accompaniment, lyrics and chord names. 48 pages. Published by Hal Leonard (HL.359902).ISBN 0881884464. With vocal melody, piano accompaniment, lyrics and chord names. 9x12 inches.This revised edition features 14 songs from Stephen Schwartz's breakthrough musical, in all-new engravings reviewed by Schwartz himself! Includes: Alas for You • All for the Best • All Good Gifts • By My Side • Day by Day • Learn Your Lessons Well • Light of the World • Prepare Ye (The Way of the Lord) • and more, plus great artwork and a note-for-note transcription of “Beautiful City” from the 2011 Broadway revival.